So You Want To Be An Appraiser? It takes more than a love for rugs and textiles to make the appraisal cut. You do not need to be an appraiser to clean and repair a rug properly. 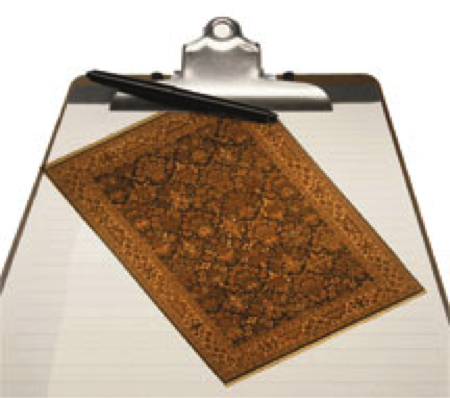 However, several people have asked me what are the steps to becoming a rug appraiser. There are a few principles and procedures to follow. A qualified appraiser has formal education in appraisal theory, principles, procedures, ethics and the law, in addition to knowledge of rugs. We’ll come back to improving that knowledge. There are two appraisal societies that provide education and testing:International Society of Appraisers (ISA) and American Society of Appraisers (ASA). ISA specializes in personal property appraisers, while ASA also includes real estate and business valuation appraisers. It’s necessary to complete the core courses taught by the societies in appraisal studies and pass their examinations with a passing grade of 80% or better. The core courses cover how to start your own appraisal business, how to accurately describe property, accurate report writing, professional ethics, appraisal theory and principles, how to conduct market and value research analysis and more. These classes are definitely college level and expensive. You must also document three years of experience in appraising or related activity in your area of expertise, submit reports to their Reviews Committee, obtain professional development points in your area of expertise, submit a log of 500 hours of appraisal experience and pass a comprehensive certification exam. After completing all of the above requirements, you become a Certified Appraiser of Personal Property (CAPP). This will give you credibility in the business world and will allow you to expand your client base. All appraisals are not alike. Always ask the purpose of the appraisal, i.e. insurance replacement, pre-purchase appraisal, an estate sale, charitable contribution, damage claim, etc. Ask your client as many questions as possible. We have all seen the Antiques Road Show. They all ask where and when did you acquire the item. What do you know about the item? These are perfectly legitimate questions. Knowing when not to accept an assignment is just as important as knowing how to perform a professional appraisal. Sometimes people want to tell you what to appraise an item for, such as estate tax appraisals. They will do everything they can to try and talk you into giving a low price. Do not accept the assignment. Being an appraiser can simply be another service that you offer in your cleaning business or retail store. If your appraisal business grows by the time you’re ready to retire, then you may choose to sell the cleaning side of your business and do full-time appraisals. However, one cannot live by appraisals alone. For your appraisal business you will need a computer, camera, research library, association dues, subscriptions, educational expenses, telephone, fax and capital. Once you make your initial investment, it’s a fairly low overhead business that can be run from home. So how do you gain or improve your knowledge of rugs? The ideal beginning is working with an experienced rug cleaner or retail storeowner who will take time to teach you the different types of rugs. This only comes with years of experience, but is the best way to learn. You need to see several rugs on a daily basis. The Association of Specialists in Cleaning and Restoration offers an advanced rug school that spends several days on rug identification. There are also many Oriental rug societies—47 exist in the U.S. They provide a wealth of information on old or older Oriental rugs and textiles through lectures, seminars and the American Conference on Oriental Rugs (ACOR). The Textile Museum, in Washington, D.C. is the only museum in the U.S. devoted to textiles of the world. They have yearly conferences. Membership or association with a trade organization is also essential. Oriental Rug Retailers of America (ORRA) conducts seminars, and the Oriental Rug Importers Association organizes one of the largest area rug and textile shows at the Atlanta Merchandise Mart. There are also magazines that can improve your understanding of rugs and textiles HALI published by Hali Publications Ltd., Kingsgate House, Kingsgate Place, London NW6 4TA, UK is an excellent publication for old rugs and textiles. GHEREH C.s Vittorio Emanuele, 40 10123 Torino, Italy, is an excellent publication with an English language edition. Museums have exhibitions, books and lectures on oriental rugs too. Once you start looking, there are great resources to learn or improve your knowledge of rugs and textiles.